Economists have been overly optimistic on the majority of economic reports for going on six months. 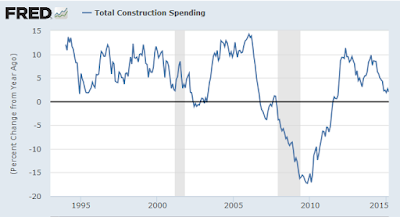 Today the Bloomberg Consensus estimate for construction spending was for a 0.4% gain. The actual result was a decline of 0.6%. 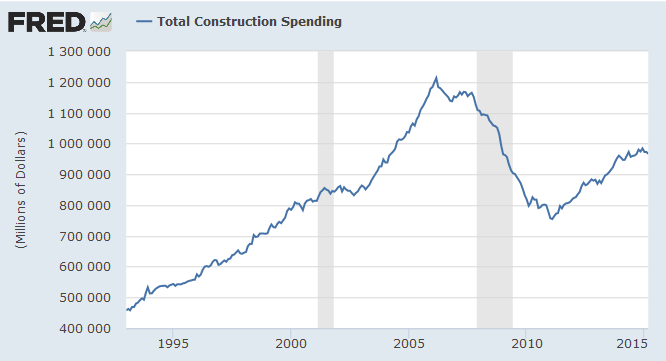 Construction spending once again defied expectations. March construction spending dropped 0.6 percent against expectations of an increase of 0.4 percent. On the year, construction spending was up 2.0 percent, down from February's annual increase of 2.7 percent. Both residential and public building declined. While weather can still be blamed for some of the decline, a basic weakness in the building sector was apparent. Private residential spending dropped 1.6 percent on the month with both single family and multi-family homes declined. In addition, residential construction excluding new homes, which captures home remodeling, also declined after gains in the previous two months. Nonresidential private construction provided a ray of sunshine -- it advanced 1.0 percent on gains in the office, manufacturing, and health care sectors. Public construction was down for a third straight month to its lowest level since February 2014. State and local government spending, the much larger portion of public construction, dropped in both February and March while Federal Government construction retreated after an 8.6 percent surge in the previous month. Weakness is "transitory" as the Fed explained on Wednesday. For discussion, please see Fed Cites Weather, "Transitory" Factors in FOMC Statement; No Hat Tricks; What About Consumer Sentiment? Clearly the economy could use more Walmarts and McDonald's as there is not yet one on every corner. Forget about the fact that wages are going up and that will damper earnings and reduce the desire to open marginal stores. See Employment Compensation Costs (Wages and Benefits) Jump in First Quarter. Millennials working multiple part-time jobs will soon buy a new home thanks to rise in hourly wage to $12. We certainly need to build more public schools as retiring boomers will be going back to 8th grade en masse. Those key points undoubtedly explain why economists are so perplexed with all this weakness.